Sakura Steakhouse menu prices page. If you don’t want to settle for anything less than a truly authentic Japanese food fare, you must choose Sakura. This Japanese restaurant offers traditional and hibachi menus for lunch and dinnertime. It also has tatami rooms, a sushi bar, outdoor dining. Sakura can accommodate everyone, whether you want private dining for two or a dinner with your group. Below are the latest Sakura menu prices. 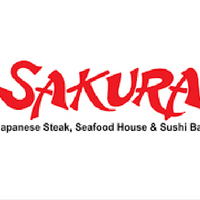 Sakura not only serves the finest Japanese meals but it also offers a number of great dining options. An instance is the Hibachi table where the cook will prepare the meal in your table. Perhaps you love sushi, then Sakura has a special Sushi area serving the most delectable Sushi meals. If you desire traditional Japanese, then you will be led to the area where the best sukiyaki and shabu-shabu are served. And for quiet dining, try the Tatami rooms. Sakura might come as expensive but actually, prices are reasonable when compared with other Japanese restaurants. It is a fun establishment where price is not an issue. Its hibachi vegetable dinners cost $17.95, chicken meals made of tender chicken are available at $20.95, and salmon meals hibachi style are at $21.95. Nigiri sushi, which is 7 pieces of raw fish on some tasty vinegar rice can be had at 19.95. They’re such low prices for really tasty Japanese dishes. From a small Japanese joint started in 1988, Sakura has blossomed into one of the most preferred restaurants in the country today. For more than 30 years, people opted for us whenever they want to enjoy the finest Japanese cuisine. Today, there are over 20 locations. For those who want only great food and best dining experience – Nippon-style, Sakura is the place to be. For more information about Sakura, visit their official website.